Has anyone seen any other entrants out there? I've finally satisfied my novice SketchUp urge. Below is a free hand version of our house. I can think of many markets where this type of small effort could provide a reasonable differentiator. Travel - web savvy accommodations could provide Google Earth versions of their guest houses, beach houses, etc. You could look out of the window and see - yes, you really can see ocean! Real Estate - this market is getting more and more sophisticated in terms of data (Zillow) and presentation (RedFin). Eventually, every property will be modeled like this - but who will be the first to provide this comprehensively. 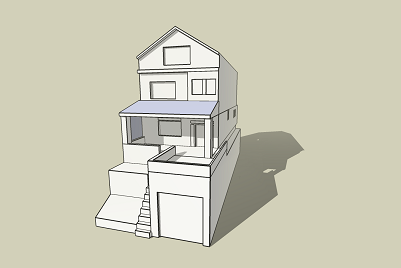 Home Improvement - pretty obvious; sketching up extensions and modifications. Overall I found the tool reasonably intuitive (which is one of its biggest selling points). However, control of a 3d pointer in a 2d interface is hard and there is still a lot of work that could be done here to improve it.